Imagine a crystal-clear river winding its way through lush, grassy banks, with green, rolling peaks towering above. Breathe the fresh mountain air and feel the tug of a rainbow trout at the end of your line. If you didn’t know better, you might think you’d gone to sleep and woken up in Montana circa 1910 – or on the set of A River Runs Through It. That’s the experience that the Linehan Outfitting Company consistently creates for its clients. Since 1993, Linehan has been in the business of bringing Montana’s final frontier to the fishing and hunting enthusiasts who are looking for something a lot less traveled. While much of the state has become popular with urban escapees and celebrity ranchers, the northwest corner can still be described as “Montana wilderness.” And nobody knows these wilds quite like the Linehan Outfitting Company founders Tim and Joanne Linehan. West of Glacier National Park and snug up against the British Columbia border, this is the spot where the Pacific rainforest ecosystem collides with the spine of the Northern Rockies. Here, every type of outdoor adventure seems ready for the taking. From catch-and-release fly fishing on the pristine waters of the Kootenai River to wild game hunting in the Yaak Valley, the roster of activities lends itself perfectly to couples, families and friends looking to bond over their love of nature. The company’s charming and ideally situated log cabins and river house complete the picture of pastoral serenity. 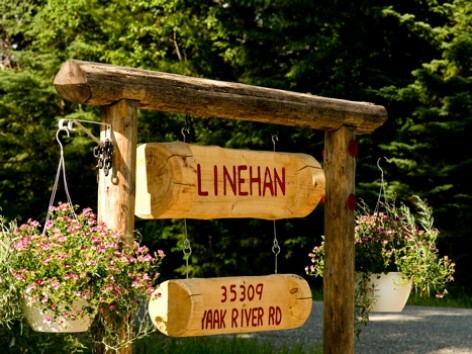 But while vast local expertise and well-appointed accommodations have certainly contributed to making Linehan the first and last name in northwestern Montana’s outfitting companies, it’s really Tim and Joanne’s joy and love for the area that keep people coming back again and again. Forget the gruff frontiersmen of yore – these friendly, welcoming East Coast transplants are truly living their dream and looking to share it with you.